Stuart is a great host. He gave us a massive upgrade over the Christmas holidays and we had the perfect stay there. Great food btw. Great hostel experience. 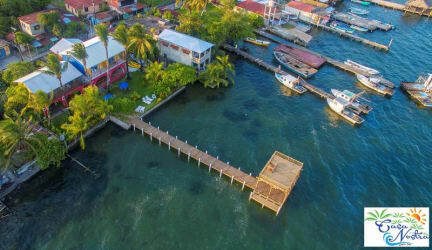 Stuart, the owner, went above and beyond to help us, giving us lots of advice for boat and bus times for Belize and Puerto Barrios. There's some crazy bird singing at 5.30 am and pm, which was definitely an interesting experience. Food was also good, I recommend trying the tapado. The rooms were clean and comfy--when we return to Livingston, we will definitely stay at Casa Nostra again. Stu is a great host with a great place. The food is great also... highly recommended!! One suggestion would be that some of he staff could do with a bit more training for service. We stayed for 4 nights in a double room with shared bathroom. The room was large and comfortable with sliding doors opening onto a verandah overlooking the garden and the water. The bathroom was just next door and had a hot shower. Stuart was very friendly and helpful. We had dinner there every night and breakfast most days - food was very good with large portions. Would highly recommend. 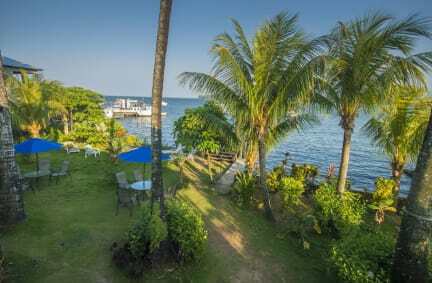 This is a great guesthouse in a great location in town with a fantastic view. The staff are so helpful and pleasant. This place also doubles up as a restaurant and is totally worth sitting in one night to dine in. Stewart, the owner was awesome, and great to talk to. His knowledge of the town is great, as he is always offering advice and tips on things to do and see. I had a great time in Livingston, as it offers a real cultural immersion into Garifuna culture. Staff were friendly and helpful, he even gave us a lift on his motorbike to help us get our passports stamped. The private rooms has comfy beds and amazing sunrise views. Food was delicious, especially the French toast. Stuart Winand from Casa Nostra, is a fantastic host, friendly and welcoming. Always ready to help and giving very useful information,The location is beautiful, and view from the balcony lovely. Room clean with comfortable beds. Half of the lights were not working, so you couldn't read after sunset and there was neither storage nor coat hangers for clothes. Communal bathroom was clean but could do with some revamping. Restaurant is pot luck: either good or terrible. Find out if chef is in before! The room was fine with a balcony overlooking the sea. The atmosphere of the hotel was cozy and welcoming. The staff we friendly and helpful. My only issues were with the power constantly going off and the shared bathroom could really use a spruce up and good cleaning, but all in all we enjoyed our stay.